Gavoille, C., Nehéz, M.: Interval routing in reliability networks, Theoretical Computer Science 333(3), 2005, 415-432. Gašo, J., Nehéz, M., Stochastic cooperative distributed grammar systems and random graphs, Acta Informatica 39(2), 2003, 119-140. Nehéz, M.: On Geometrical Properties of Random Tori and Random Graph Models, Journal of Electical Engineering, Vol. 51, No. 12/s, 2000, 59-62. Nehéz, M., Olejár, D., Demetrian, M.: A Detailed Study of the Dominating Cliques Phase Transition in Random Graphs, In Proc. 9th Annual Conference on Theory and Applications of Models of Computation TAMC 2012, LNCS 7287, Springer-Verlag, Berlin Heidelberg, 2012, 594-603. Chudá, D., Nehéz, M., Čerňanský, M.: On using of random access machine simulators in teaching of theoretical computer science, In Proc. CompSysTech 2009 (Int. Conf. on Computer Systems and Technologies and Workshop for PhD Students in Computing), ACM New York, 2009, Article No. 84. Nehéz, M., Olejár, D.: An Improved Interval Routing Scheme for Almost All Networks Based on Dominating Cliques, In Proc. 16th Int. Symposium on Algorithms and Computation ISAAC 2005, (X. Deng, D. Du eds. ), LNCS 3827, Springer-Verlag, Berlin Heidelberg, 2005, 524-532. Nehéz, M., Bernát D.: On Communication Protocols in Unreliable Mesh Networks and their Relation to Phase Transitions, In Proc. 17th International Conference on Parallel and Distributed Computing Systems PDCS-2004, San Francisco, ISCA Cary, 2004, 235-240. Gavoille, C., Nehéz, M.: Interval Routing in Reliability Networks, In Proc. 10th Int. Colloquium on Structural Information & Communication Complexity SIROCCO 2003 (J. Sibeyn ed. ), Carleton Scientific, 2003, 147-162. Nehéz, M., Mäsiar, J.: On Propagation in Social Networks – A Graph Mining Approach, In Proc. 6th Int. Workshop on Knowledge Management, VSM School of Management, Trenčín, 2011, 107-118. Nehéz, M., Warenichová, D.: On Analysis of Small Social Networks, In Proc. 5th Int. 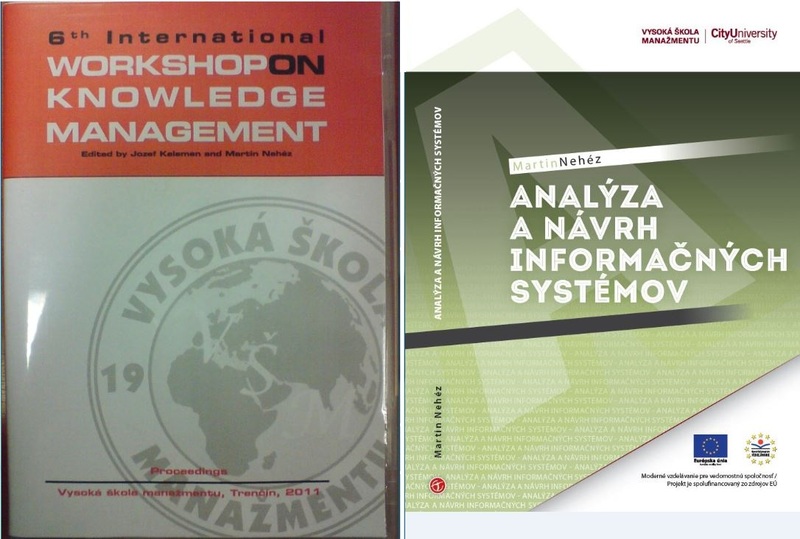 Workshop on Knowledge Management, VSM School of Management, Trenčín, 2010, Article No. 6. Nehéz, M., Piovarči, A., Sváková, A.: On Business Process Flows Modelling by UML Sequence Diagrams, In Adjunct Proc. 2nd Int. Conference on Ambient Intelligence Forum 2009, Gaudeamus, Hradec Králové, 2009, 46-55. Nehéz, M., Bartalos, P.: On Space Complexity of Sparse Graphs Representation, In Proc. 6th Int. Conference APLIMAT 2007, Part III, (M. Kováčová ed. ), Dept. of Mathematics, Faculty of Mechanical Engineering, SUT, Bratislava, 2007, 219-226. Nehéz, M.: On Relationship between Parallel Reduction and Leader Election Problem in Distributed Systems and Networks, In Proc. of WORKSHOP 2007, CTU Reports, Part A, Special Issue, Vol. 11, CTU Publishing House, Prague, 2007, 190-191. Nehéz, M.: Theoretical Analysis of Routing Latency in Special Types of Networks, In Proc. of WORKSHOP 2006, CTU Reports, Part A, Special Issue, Vol. 10, CTU Publishing House, Prague, 2006, 224-225. Nehéz, M., Chudá, D.: Serialization of Transactions: A Graph-Theoretic Approach, In Proc. of WORKSHOP 2006, CTU Reports, Part A, Special Issue, Vol. 10, CTU Publishing House, Prague, 2006, 226-227. Nehéz, M.: On Subgraphs with Compactness 1 in Random Meshes, In Proc. 3rd Int. Conference APLIMAT 2004, Dept. of Mathematics, Faculty of Mechanical Engineering, Slovak University of Technology, Bratislava, 2004, 729-734. Gavoille, C., Nehéz, M.: On Interval Routing in Random Meshes, In Proc. European Conference on Combinatorics, Graph Theory and Applications EUROCOMB 2003 (J. Fiala ed. ), ITI Charles University, Praha, 2003, ISBN 80-239-1185-6, 147-150. Nehéz, M.: Robustness Properties Thresholds in Reliability Networks, In Proc. 6th Int. Multi-Conference Information Society IS 2003, ABO Grafika, Ljubljana, 2003, ISBN 961-6303-52-X, 288-291. Nehéz, M., Gašo, J.: Unreliable Engineering Systems and Kolmogorov Complexity, In Proc. 1st Int. Conference APLIMAT 2002, Dept. of Mathematics, Faculty of Mechanical Engineering, Slovak University of Technology, Bratislava, 2002, ISBN 80-227-1654-5, 301-308. Cuper, P., Mácová, M., Nehéz, M.: Deductive Database Systems and Programming Languages Prolog and Datalog, In Proc. 7th Int. Scientific Conference on Quantitative Methods in Economy and Business (1st section Creation and applications of inf., knowledge and database systems), EKONÓM, Bratislava, 2001, 133-137. Nehéz, M.: Stochastic L-Systems and Automatic Graphs, In Proc. 7th Int. Scientific Conference on Quantitative Methods in Economy and Business (1st section Creation and applications of inf., knowledge & database systems), EKONÓM, Bratislava, 2001, 202-203. Nehéz, M.: Shortest Path Routing in Regular Random Graphs, In Proc. ELITECH 98, STU Bratislava, 1998, ISBN 80-227-1110-1, 234-237.